A must-have tool for learning vocabulary. Whenever I get a new student, one thing I always recommend is cue cards. Cue cards are an extremely useful tool when learning languages, and I use them myself all the time. They play an indispensable role in memorising new vocabulary. In my 3 Minute Languages courses, each lesson gives you a handful of new words and phrases, and then you get the opportunity to practise them by putting them into sentences. To aid the learning process and to make the new words into memories more quickly, what you can do is get some cue cards. You can find cue cards in most stationery shops or even online, however, if you can’t find any, just cut up some pieces of paper into smallish rectangles and they’ll do the same job. 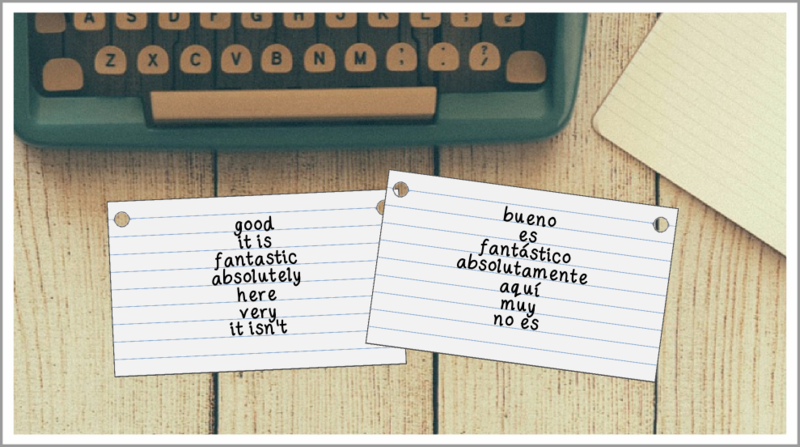 After each lesson, grab a cue card and write down any new words you have learnt. You should do this in a very specific way. For effective memorisation, you should write the new words in English down the middle of one side of the cue card, then turn it over and write the words in French (or whichever language you’re learning) down the middle of the other side. If you look at the picture below, you can see what the cue card for the first 3 Minute Spanish lesson would look like. The reason you should write the English on one side and the other language on the other side is so that, when you practise, you can read through the words on the English side and try to guess the French words. For example, if you see “fantastic”, then you can think, “fantastique”. In the full 3 Minute Languages: Course 1, there are nine lessons, so you will have nine cue cards filled with words and phrases. You should look at these cue cards every day for just a few minutes. Only ever look at the English side and try and guess the words in your new language. Only turn it over if you really can’t think of the foreign word. It will help to embed the new words and phrases in your mind. Obviously, going through the words on the cue cards isn’t going to take more than a few seconds, so what you can also do is build a few sentences in your mind for each word you come across. For example, if you come to the word “good”, you can try and say things like “it is good”, “it is always very good here” or “it isn’t very good”. Say these sentences out loud (if nobody is around!) to help get your tongue around the language. It will make it much easier for you when you actually come to use the words and phrases in a real life situation. So, cue cards are a great way to memorise the new words and phrases you get from each lesson. Look at them every day, only look at the English side and try to guess the other language, and try and build a few sentences that you could use for each word. What if I still can’t remember the words? Sometimes, even with the cue cards, there will be one or two (or maybe three or four!) words that just won’t stick in your head, no matter what you do! Don’t worry; it’s perfectly normal, but there is something you can do about it. Read my next article, “Words that just won’t stick in your brain” to find out more.